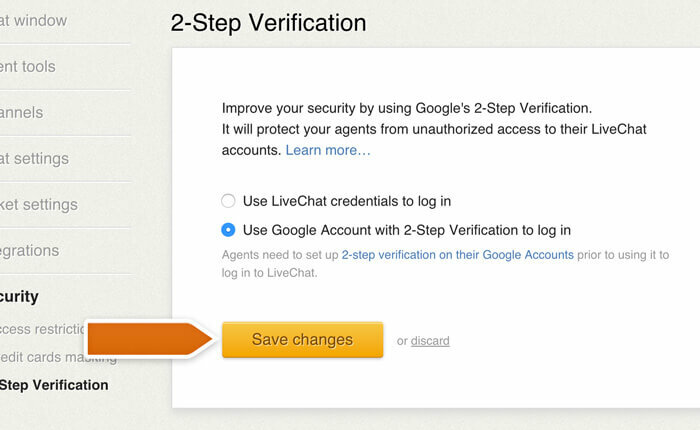 You can get the benefits of 2-step verification when logging in to your LiveChat by using your Google Account. This additional security measure will make any undesirable login attempts nigh impossible. 2-step verification is available for the Team, Business and Enterprise plans. 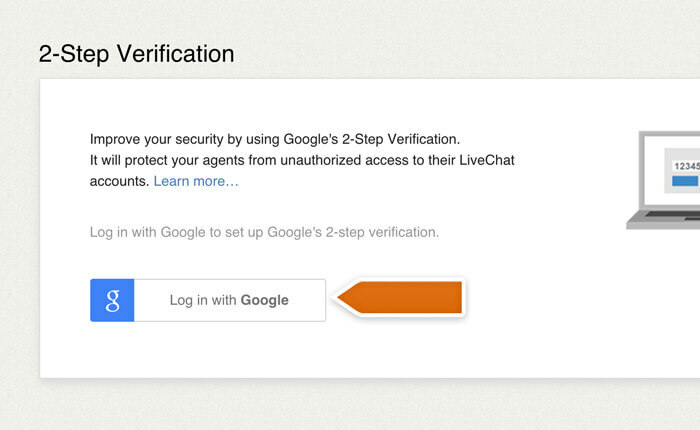 To use Googles’s 2-step verification for LiveChat, you will have to first enable it on your Google account. 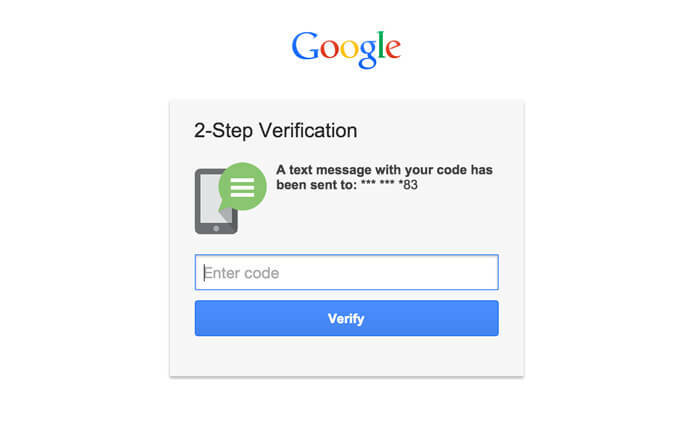 2-step verification changes the way you log in to your Google account. When it is enabled, you will need to normally enter your Google account password. After you enter the password, Google will send you a text message with a security code to your phone. You will need to enter the code to log in. You can set up two-step verification on your Google account on the 2-step Verification settings page. There’s a short tutorial that will guide you through the process. To enable the two-step verification for your LiveChat, log in normally and go to the 2-Step Verification section. Once there, click on the Log in with Google button and use your Google Account to log in. Choose the account you want to use to log in to LiveChat. You need to have 2-step verification enabled on that Account for it to work with LiveChat. You need to use your Google account address for your LiveChat account to be able to log in to LiveChat with your Google account. Once you log in with your Google Account, select the Use Google Account with 2-Step Verification to log in option. Click on the Save changes button to finalize. 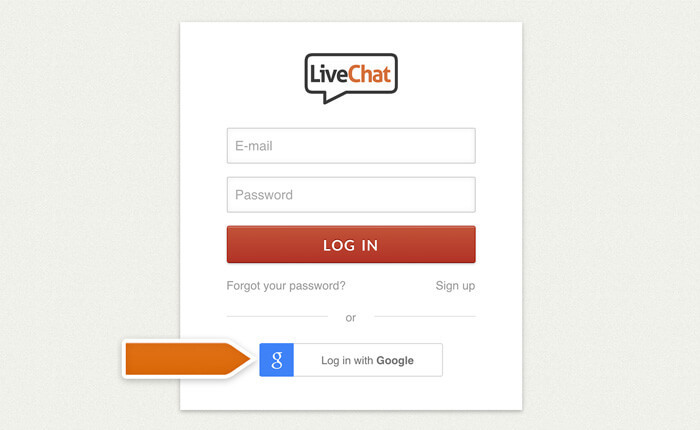 From now on, you will need to use your Google Account to log in to LiveChat. To do that, simply select the Log in with Google option when logging in. You will also need to provide the security code. When the 2-step verification is enabled, you won’t be able to use your LiveChat email and password to log in. To switch back to logging in with your LiveChat email and password, go to the 2-Step Verification section, select the Use LiveChat credentials to log in and click on the Save changes button.